If you're a fellow procrastinator like me, you still have some holiday gifting to do, not to mention entertaining, baking, wrapping—the works. If you're in a pinch, nothing warms the cockles quite like a top-shelf bottle of liquor, and with all of the booze delivery options these days, you really have no excuse. You could also check with your favorite bar about gift certificates—a great way to spread cheer and support the hospitality scene at the same time. Here are some more last-minute gift ideas to make the holidays merry and bright for all the cocktail lovers on your list. Brooklyn design shop Love & Victory offers lots of charming gifts, from hand-engraved decanters and glassware to the most adorable cocktail pins. This set of flamingo tiki glasses ($29) caught my eye, and the packaging includes a handy pina colada recipe. You'll want to act fast, as Love & VIctory's shipping deadline for holiday is December 15. I've been a fan of Owl's Brew tea mixers for some time now, and their holiday gift set ($28) is perfect for anyone looking to spice up a drink or punch without too much effort. The set includes three 8-oz bottles: Wicked Green, White & Vine, and the oh-so-seasonal Mulling Spices (cinnamon, ginger, cloves, cardamom), cranberry, apple pieces, brown sugar, apple juice, cranberry juice, maple syrup, and citric acid. Last year, Cocktail Kingdom teamed up with spirits historian and author David Wondrich to release a line of vintage-inspired cocktail tools and serverware. The punch set ($130) features an English style ladle, six elegant punch cups, and a stoneware bowl featuring a Cicero quote that translates to “Let us eat, drink, enjoy life, after death there is no pleasure.” Once again shipping deadlines are upon us, so act quickly for any Cocktail Kingdom orders. Cocktail Courier, a cocktail subscription box service, has partnered with Williams Sonoma to offer a variety of cocktail kits for the holiday season. Start with the mini cocktail kit ($29) in tasty options such as the Cinnamon Daiquiri, Improper Gin and Tonic, and the French 75, among others. Decorative cocktail picks paired with a jar of brandied cherries or martini olives always makes for a nice gift for the home bar enthusiast who has everything. This pineapple cocktail pick set ($40) comes in a handy pineapple holder, making for a snazzy addition to the bar top. Let's say you ran out of time to find the perfect gift for your party host, and you want to offer a bit more than just another bottle of wine or bubbly—bottleneck accessories ($8) to the rescue! This is one of those "Why didn't I think of that?" ideas—a package of balloons and confetti ready to hang around the neck of a gifted bottle, bringing instant party vibes. Brilliant. Still have some last-minute holiday shopping to do? You can always take the tried-and-true route and give all of those cocktail lovers on your list a shiny new bottle for their top shelf. Of course, you might be tempted to keep those kinds of gifts for yourself. Here are some other suggestions for the tipplers on your list. Cheers to a safe, warm, and peaceful holiday season, and please, be kind to your neighbors! Gents, need a dapper accessory for your holiday or New Year's Eve outfit? Look no further than Forage Haberdashery, a line of handcrafted bow ties, neck ties, handkerchiefs and more. They also offer a line of bows for the ladies. Reasonably priced with free domestic shipping, get 20 percent off with the code HOLIDAY, and as an added bonus, your package will arrive pre-wrapped in handsome black paper and string. For the Zombie drinkers on your list, bring some goth to their tiki game with these Grave Digger cocktail picks ($10.50) made from howlite turquoise and food grade stainless steel. Plus, the seller's name is Dizzy Diva, so she's obviously doing something right. For the party hosts who seem to have everything, you can't go wrong with gifting them a new set of rocks glasses. This Double Old Fashioned set from West Elm ($30 for 6) offers geometric intrigue and a modern touch that will liven up any bar top. For the frequent flier, the Carry-On Cocktail Kit ($24) is a winning move. Have the most dignified flight ever with this handy kit that includes aromatic bitters, cane sugar, a muddling spoon, a recipe card, and a linen coaster. Just add a mini bottle of whiskey and ice, and you'll have yourself two Old Fashioneds at any altitude. The growler craze has taken full hold 'round these parts, and NYC bars serving beer to go are a dime a dozen. Help your favorite beer drinkers keep their crafty suds mobile with this bicycle-friendly growler ($50) that holds 64 oz. Taste your way through 500 original cocktail recipes from one of NYC's most celebrated drinking dens with Death & Co: Modern Classic Cocktails ($26) by David Kaplan, Nick Fauchald, and Alex Day. The elegant tome lays out instructions that are simple enough to follow at home. Soon enough you'll be whipping up Oaxaca Old Fashioneds of your own--just be sure to dim the lights down low and burn some candles for the full effect. For the cocktail geeks on your list looking to sharpen their skills, hand them a copy of The Bar Book: Elements of Cocktail Technique ($20.95) by Jeffrey Morgenthaler. The Oregon bartender and blogger is known for his expertise, and here he breaks down every step needed to make cocktails that taste just as good as those from your favorite craft cocktail bar. Don't be surprised if the recipient of this gift starts crowding the refrigerator with jars of homemade syrups, sodas, and infused tinctures. For the whiskey lover with an attention span, book a seat (or two, and save one for yourself, naturally) in the best kind of school around--the Spirit School at Brandy Library ($55-$120 per class). Not only will they expand their palates with tastings such as "Rare and Precious" and "Japanese Whiskey at its Best," but they'll be treated to expert guidance from the Brandy Library's spirit sommeliers. Know a cocktail fan who does a lot of frequent flying? The Bitter Truth Cocktail Bitters Traveler's Set ($18.99) is designed to pass TSA standards and includes 20ml bottles of celery, orange, creole, old time, and Jerry Thomas bitters. Every cocktail lover needs a good flask -- how else are we supposed to enjoy Negronis in broad daylight or during office hours? This leather-covered vessel from J. Crew ($34.95) will separate the debonair from the debaucher. Flip through more than 80 elegant recipes of Prohibition-inspired tipples in "Speakeasy: The Employees Only Guide to Classic Cocktails Reimagined" ($24.99) by Jason Kosmas and Dushan Zaric. The West Village master mixologists break down variations on the classics and creations of their own. Krystina Castella was smart enough to write "Booze Cakes" ($12 ) a cookbook combining everyone's two favorite loves -- booze and baked goods. She might not have the recipe for my infamous whiskey old fashioned cake in there, but you will find knockout photos and recipes of confections such as Pina Colada Cake, White Russian Cupcakes and Honey Spice Beer Cake. Know someone who's just getting started in bartending or could use a refresher? "The Big Bartending Book" by and Jeff Masson and Greg Boehm ($9.95) offers clear instructions on how to whip up 1,000 top cocktails and plenty of advice to give newbies confidence behind the stick. This is a great idea for wine lovers -- A Date With Wine bottle stopper ($45) makes it easy to remember when you last opened that delicious bottle of vino. You'll never drink musty, overexposed wine again. And how gangsta are these shot glasses? Mug Shots ($16.95) is a set of six shot glasses featuring the mugs of the most notorious gangsters in history, from Al Capone to Bugsy Siegel. There are plenty of funky-shaped bottle openers out there, but this iron set of Nambu Tekki Tool Bottle Openers ($20 each) look cool hanging in your kitchen and have versatility -- such as for smashing up some ice. If you were at the Holiday Spirits Bazaar (recap to come), then hopefully you got a chance to try SkimKim's Blooody Kim Jong-Il Mix ($10), a tantalizing blended kimchee bloody mary mix. Beyond vodka, I would pour this on just about everything, from tacos to meatloaf, or just eat it straight from the jar -- it's that good. Give your home bar an instant soda fountain with the SodaStream Red Crystal Soda Maker ($179.95), which turns ordinary water into sparkling water or soda. Easy to transport, no electricity required, and if you buy it at Sur La Table, they will recycle the spent carbonation canisters for you and give you a discount on new ones. You can search flea markets far and wide for a decent punch bowl, but if you are looking to give a punch serving set as a last-minute gift, look no further than Crate & Barrel's Virginia Punch Bowl Set ($136.95). 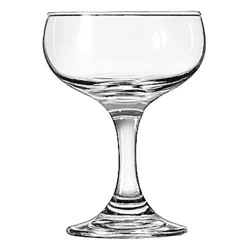 The elegant footed bowl and cups made of handblown and molded glass will turn any house party into a dignified soiree. Hopefully by now you're doing better than I am and you're already done with your holiday shopping. If like me, you were busy with too many pre-holiday events and are now shopping last-minute, here are a few handy ideas for those cocktail lovers on your list--good luck!